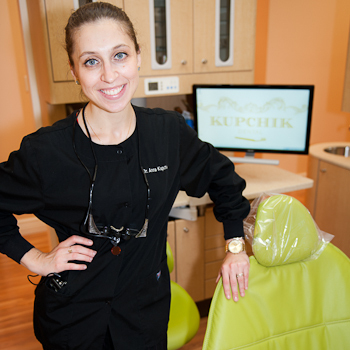 Dr. Anna Kupchik is committed to providing excellence in dentistry, and is considered one of the leading family and cosmetic dentists in West Nyack and New City. Dr. Kupchik received her Doctorate in Dental Surgery from the University of Southern California (USC) School of Dentistry. She was on the Dean's List for four consecutive years, and was awarded an honors scholarship. During her time at USC, she had the privilege of learning from leaders in the fields of cosmetic dentistry and implant dentistry. Dr. Kupchik is a member of the American Dental Association, Academy of General Dentistry, New York State Dental Association, and California Dental Association. Dr. Kupchik uses the latest in dentistry techniques to provide you with a beautiful and healthy smile, and believes strongly in the importance of education to prevent oral health problems before they occur. She also believes in keeping patients fully informed on all of the options available to address their individual needs. Learn more about Dr. Kupchik's unique approach to family and cosmetic dentistry. Make an Appointment Today! Call 845-535-3500.